Strawberry Hill, the gothic villa created by Horace Walpole in Twickenham, is currently hosting what they have called a “once-in-a-lifetime” exhibition, on display until February 24, 2019: “Lost Treasures of Strawberry Hill: Masterpieces from Horace Walpole’s Collection.” At Home Subjects, we love to see works of art in the domestic environment, and the Strawberry Hill exhibition promises a rare treat: a chance to see some of Walpole’s prized possessions in the home he designed as their showcase. Exterior view of Strawberry Hill House, Twickenham, London. An inveterate collector, Walpole assembled more than 6,000 artworks and artefacts for display at Strawberry Hill over a period of forty years, carefully orchestrating the displays in themed rooms that showcased, for example, the work of Hans Holbein for the Tudor court or the drawings of Lady Diana Beauclerk. The contents of the house were dispersed in 1842 during a 28-day event that was called “the sale of the century.” Although Walpole was very interested in the—sometimes highly imaginative— provenance of objects, other collectors were less assiduous (or fanciful) in noting the Walpole connection. 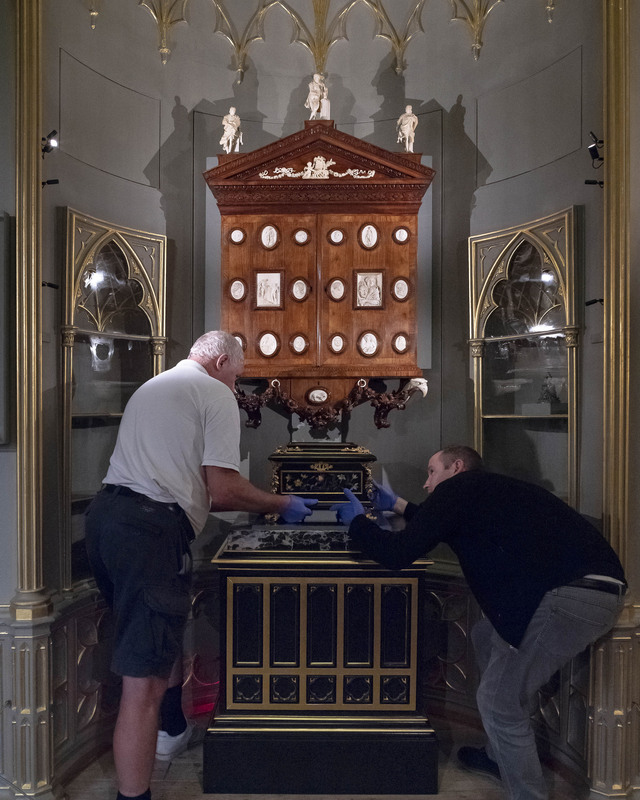 The exhibition’s curators engaged in what the exhibition calls a “treasure hunt,” locating more than 200 of Walpole’s former possessions in museums and private collections across the globe. They were assisted in this quest by the Lewis Walpole Library at Yale University. For most of the twentieth century, Wilmarth S. Lewis, a Walpole scholar and editor of the Yale Edition of Horace Walpole’s Correspondence, was the chief collector of pieces from Strawberry Hill, which he bequeathed to Yale University in 1980. 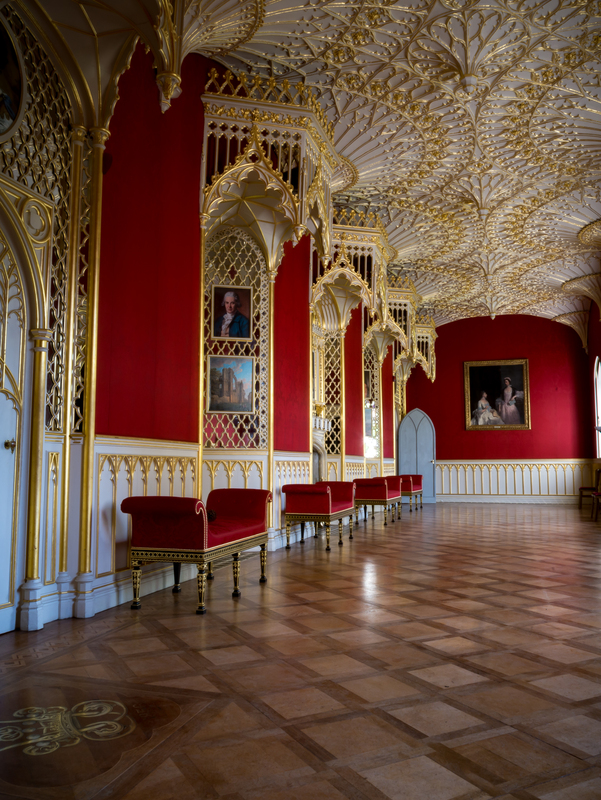 The Gallery, Strawberry Hill. Photo Credit Kilian O’Sullivan. 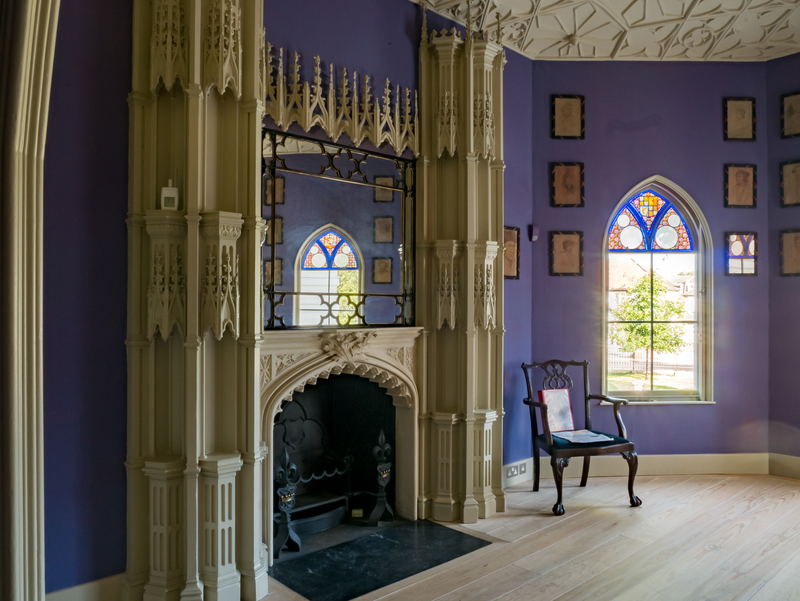 Visitors to the exhibition move through the spaces of Strawberry Hill, charting its evolution from decorative project to architectural innovation. Walpole began by putting a Gothic shell around an older building, and he later built additions to that structure, creating the most important spaces for art and object viewing in his home: The Gallery, The Holbein Chamber, and The Tribune. Walpole obsessively catalogued his collection in A Description of the Villa of Horace Walpole, published in 1774, creating detailed accounts of each of the main rooms in his villa. Most of the works on display in the exhibition are shown in their original position. Visitors to the exhibition are given a small guidebook and told, somewhat apologetically, that not all works are in the position indicated in the booklet’s diagrams. As a guide mentioned during my visit, the attempt to hang François Clouet’s Portrait of Catherine de Medici and her Children (now downgraded to a studio production) in its original position in the Gallery was stymied by the door jamb: the picture didn’t fit! 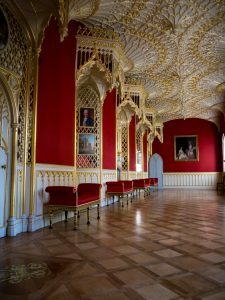 The guide surmised that a later owner of Strawberry Hill must have raised the floor, and therefore the door frames. Joshua Reynolds, Portrait of the Ladies Waldegrave, 1780-81. Oil on canvas, 143 x 168.3 cm. Painting purchased with the aid of the The Cowan Smith Bequest Art Fund 1952 © National Galleries of Scotland. Edinburgh. The intention to see the original objects in their original positions is not necessary undermined in these instances, although I was taken aback to see a few reproductions scattered amongst the original paintings in places such as the Gallery. 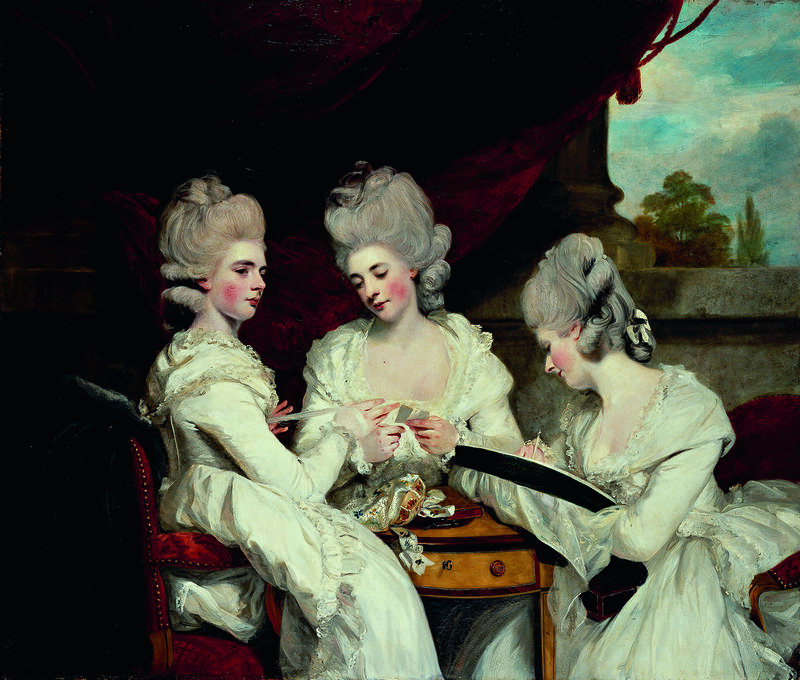 It made me wonder what the effect would be to see Strawberry Hill completely restored through the laser scanner and the 3-D printer—does it matter if we see the “real” Ladies Waldegrave by Sir Joshua Reynolds in the Great Parlour, while a number of works in the Gallery hang next to “replicas” that remain unidentified in the exhibition brochure? Am I being asked to focus on the Reynolds’s painting that Walpole appreciated as a work of art, or am I being asked to marvel at the ensemble of this room where family portraits make manifest the social standing of the Walpole family, including Reynolds’s portrait of Walpole’s great-nieces? Luckily, Walpole himself provides some answers—or approaches—to this conundrum. First and foremost, he did not disdain copying. It could be a vital part of artistic training as well as an act of homage, and it was a convenient way to obtain a desired image. The Holbein Chamber. Image courtesy Strawberry Hill. For example, it seems perfectly appropriate that the Holbein Chamber features reproductions of the now-discolored tracings of Holbein drawings prepared for him by George Vertue. In addition, Walpole valued artifice. He prized objects for their historical or literary associations above all else, admitting that he sometimes purchased objects that were “more decorative or theatrical rather than connoisseurial.” Walpole also preferred objects redolent with personal significance (like family portraits) or historical connections (like the Cardinal’s hat). As one of the gallery guides put it during my tour, “he loved a good story.” For example, Walpole supposedly wore Grinling Gibbons’ masterful carved wood cravat to a social gathering, celebrating the skill of the artist at fooling the eye while challenging his guests to call his bluff. As much as he appreciated the aesthetic and historical value of the objects in his collection, he certainly treated some objects as decorations. Godfrey Kneller’s Portrait of Lady Anne Osborne is a full-length portrait of Walpole’s great-aunt. The canvas is now studded with nail marks in the shape of a 3/4 length portrait. The collector wanted it to match the portrait of Dorothy Walpole, Countess Townsend by Charles Jervais and had the painting folded over and re-mounted to match. Cabinet of miniatures and enamels, designed by Horace Walpole. The ivory figures are of Andrea Palladio, François Duquesnoy and Inigo Jones. V&A. 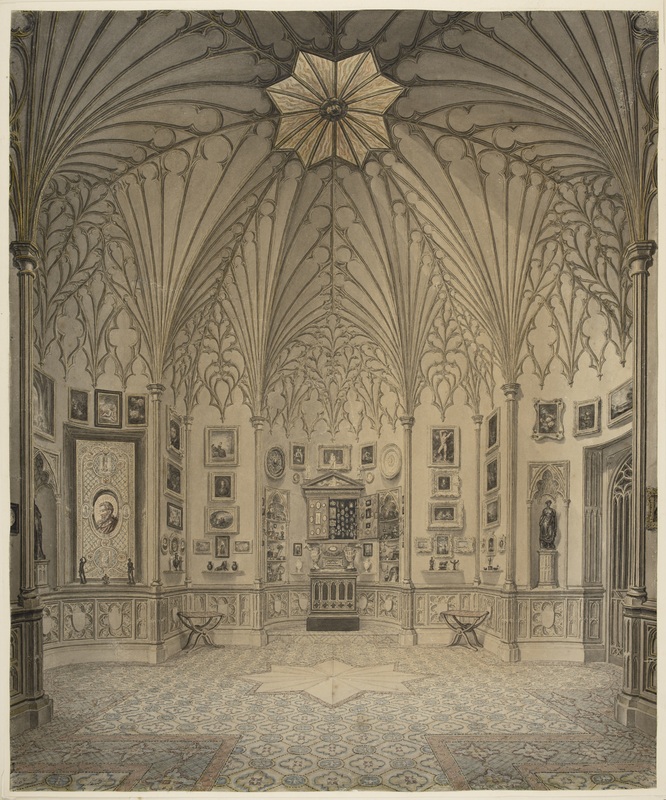 In addition to providing the visitor with insight into how Walpole lived with art, the exhibition also foregrounds the ways in which the collector organized his life, or at least his living space, around that art. The types of spaces he devised are distinct to the types of objects they were meant to feature, as well as the kinds of responses they were meant to provoke in the viewer. The Holbein Chamber is essentially a small museum of Henry VIII, while the Gallery is organized as a picture gallery, asking the visitor to focus on the paintings. In contrast, the Tribune, named after the Medici treasure room in the Uffizi, was conceived as a “cabinet” of prized and unusual objects, all presided over by a bust of Walpole’s mother. One of the facets of Walpole’s collecting that emerges forcefully in the exhibition, especially in the Tribune, is the collector’s interest in small objects, often those that manifest a tactile quality. Walpole designed his own cabinet, perhaps with the advice of William Kent, to house 86 portrait miniatures and enamels as well as other objects that he deemed significant. The ornamentation celebrates the arts of painting, sculpture, and architecture, topped with three ivory figures: Andrea Palladio, François Duquesnoy, and Inigo Jones. This diverse and perhaps surprising pantheon suggests the spirit of liberalism that underpinned the collecting of the Whig politician. Seeing the “lost treasures” installed at Strawberry Hills calls to mind Walpole’s own advice about having pictures in the home. He believed that “opposition makes harmony”—masterpieces and replicas, ancient bronzes and locks of hair, Walpole family ancestors and the Tudor dynasty. All come together to make up the fascinating assemblage of a singular collector. The exhibition is a wonderful opportunity to explore these, as well as other, questions while immersing oneself in Walpoliana. 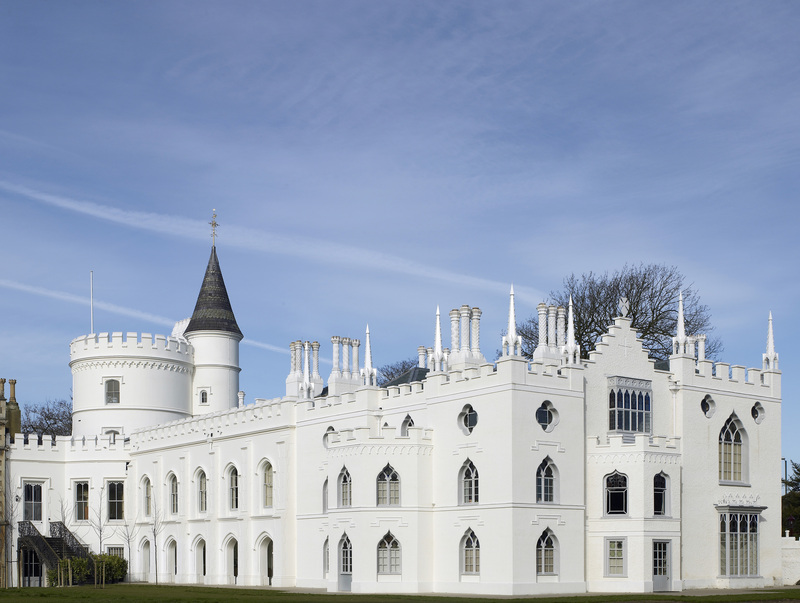 Readers and visitors who want to learn more will enjoy the database “Horace Walpole’s Strawberry Hill Collection” set up with the Lewis Walpole Library.